Mirabelle’s location puts you just minutes from great shops and restaurants on the island. Its super modern and chic, and has a massive pool where you can wade around with kids or pedal through the water on the sunken stationary bikes- talk about a workout! Plus, the kitchen is super well-equipped and airy. If you want something breezy and chic, you can’t go wrong with this villa. Walk to Baie Rouge Beach! 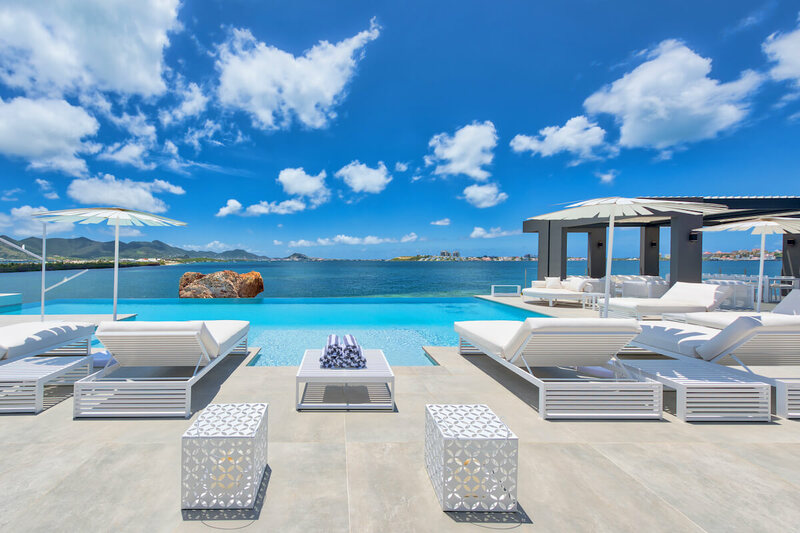 Mirabelle Villa is a spacious, open home that sits at the edge of Simpson Bay Lagoon. This fully air-conditioned villa is in a gated community for the ultimate privacy and security. A private pier for swimming and boating allows guests to easily explore the coast. There is a huge pool along the edge of the deck with two submerged stationary bikes, a wading area, and ocean views. The deck has several daybeds, chaises, and armchairs for lounging and dining in the sun or shade. The veranda shades a living area, dining tables, and part of the kitchen. Sliding glass doors lead into the villa’s common area. The open-concept living room has lots of seating, uniquely modern decor, a top-notch entertainment system, massive flatscreen TV, and a library. The whitewashed kitchen has top of the line appliances, expansive countertops, exterior access, an espresso machine, and a TV. All four bedrooms have a king bed, ensuite bathroom, and ocean views. The ensuite bathrooms have large vanities, walk-in showers, and ocean views. Two open to the terrace. Located in the lagoon with a private dock, Mirabelle is just a 10-minute walk to Baie Rouge Beach and a few minutes’ drive to fine dining, gambling, and shopping. Baie Rouge Beach is 300m away from villa.